And so the annual dance off begins. No, it’s not Strictly, it’s this year’s Just Dance game and our household floor has been reinforced ready for some suspect dance moves. Despite other companies trying, Ubisoft still seems to have the crown for dancing games with their annual roll out of the trusty Just Dance franchise. Every year there are tweaks and changes to the formula but it’s the mix of songs and the completely mad choreography that are the stars. That said, Just Dance 2019 has a brand new front end and it’s all the better for it. The clean looking menu immediately pops you in to the song selection screen with an almost Nintendo-like simplicity that makes it far easier to find a game or mode. You’ll need to dance to a couple of songs before you unlock all the options and four if you want to unlock Just Dance Unlimited, Ubisoft’s impressive paid online service that provides hundreds of songs to immediately pick up and play, but in general the game plonks you straight in to the action. If you’ve played the previous games on the same console then you’ll also get a bonus as Just Dance 2019 recognises your avatar. It’s a nice touch considering the fans will be the most likely to grab the latest version early on. Even if you haven’t played a Just Dance game before, this year’s title is immediately accessible. All you really need to know is that you hold one Joycon (or pose in front of the camera for PS4 and Xbox One) and follow the on screen dancer, mirroring their moves. The next few moves will also appear across the bottom of the screen to prepare you but most of the time you’ll be better off just copying the dancer in real time. The songs this year, as in previous years, range from up-to-date chart hits like Ariana Grande’s No Tears Left to Cry and Finesse from Bruno Mars to covers of 90s dance classic Rhythm of the Night and Elton John’s catchy I’m Still Standing, as well as the usual inclusion of the oddball number, this time a remix of the Pac Man theme tune. Sadly there seems to be a complete lack of J-pop this year, which I found disappointing. 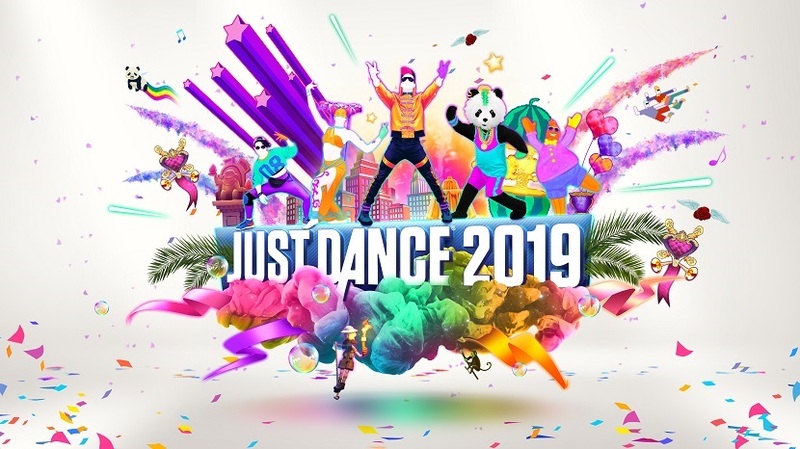 Just as I think Ubisoft have managed to reach the point where their choreography can’t get any weirder, the next Just Dance game goes and proves me wrong and 2019 doesn’t disappoint. With everything from claymation to puppets and the now infamous dancing panda, there’s never a dull moment on screen. Thankfully, the backgrounds don’t detract from the dancers, so it’s always easy to keep an eye on them, even if you can’t always keep up. Just Dance Unlimited comes free for 30 days, even if you’ve previously owned it, which provides plenty of other songs to dance to. It’s seamlessly integrated in to the menu so choosing a song from the unlimited selection is just as easy as picking one from the main game. While it’s most likely a good money spinner for Ubisoft, I really like the service, which feels pretty much like a streaming music service for the game. It’s also easy to drop in and out of the service as you need it, just paying for a day, month or year. There’s no big innovation in Just Dance 2019 and, in fact, it has one omission since the ability to use your phone as a controller is currently missing, but the new streamlined menu and the usual top quality selection of songs that cover enough different styles to appeal to a huge crowd, plus the infectious choreography and ease in which you can get into the game with up to 6 players, make this another essential purchase for dance fans or those who like to put on a party.